I'm at the 50 followers mark! That means I can start my contest! Below, you'll find the rules and prize list. 1. To enter my contest, you must be a follower. I will check! Also just to let you know, this is open worldwide. 2. Leave a comment on this post saying "Enter me". That will count as one entry. The only way that I'll allow more entries from one person is listed in rule #3. 3. 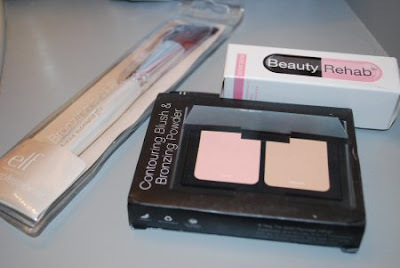 To gain two extra entries, you can post about my contest to your blog. If you do so, please comment here with the link to your post. 4. I will choose the winners by making a numbered list with your name on it. If you have three entries, I will list your name the three times. I will then use random.org to choose the winners and if your name is by the number given, then you win! Pictures and screencaps will be provided to show you that it is fair. 5. I've decided to give first and second place prizes. So you have a good chance of winning! 7. You must be 18 or have the permission of a parent. You also have to be comfortable with emailing your address to me so that I can send your prize. 8. Contest will end at 11:59 PM EST on February 28, 2010. MAC Pigment Sample in Teal - I scooped a massive amount into the container, so you get way more than if you were to buy a sample online! Not to mention, I always use my pigments with a clean scoop and put it into little jars. So this sample comes from a completely sanitary jar! MAC Sample of Prep + Prime Powder- Again, this comes from a completely sanitary jar. Betty Brush Bag from Benefit- Brand new makeup bag from Benefit! Soap & Glory Mother Pucker Lip Gloss- Everyone needs something from Soap & Glory! 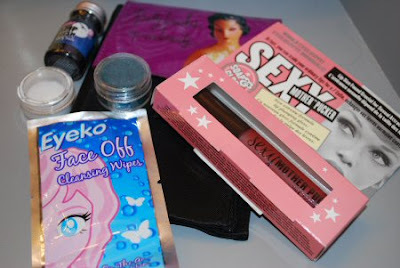 Eyeko Face Wipes and a Vamp Nail Polish- Eyeko is a great brand from the UK! Cute packaging too! Rose Salve- I got this from Eyeko. I love rose salve and it has many uses! E.L.F. Blush Brush- The E.L.F. brushes are the best in their price range. Heck, if I'm feeling in a good mood...I might add an extra or two to the prizes! Good luck to all of you! Thanks for following my blog! XOXO.